Hover your mouse over each picture to read about each leader OR tap the picture on your phone screen! 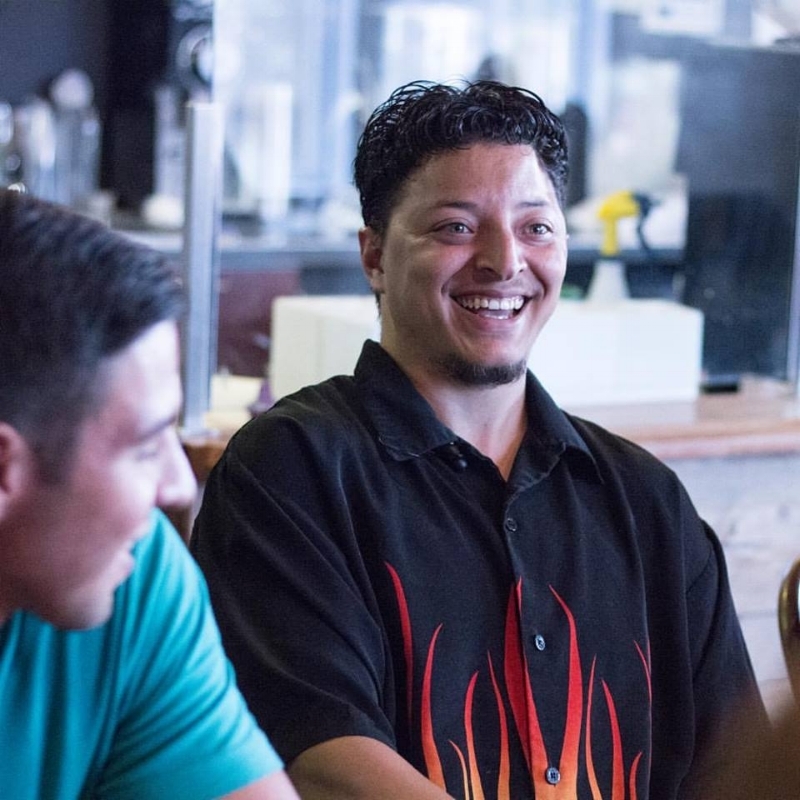 Justin grew up in Mesquite, Texas, a city just outside of Dallas, after his father went to prison when he was four years old. He and his younger brother Jon, were raised by their mother with the help of his grandmother and uncle. Justin was exposed to drugs at a very early age and by the time he was fourteen had already begun living a lifestyle of consistent drug use coupled with all that way of life entails. It was that year that Justin had a radical encounter with Jesus while he was getting high at a friends house. Instantly delivered from drugs, Justin's life began a new path that lead him to another tremendously impactful encounter with Holy Spirit when he was eighteen. After this encounter Justin enrolled at Charis Bible College, CO where he graduated and then did a year long internship. It was during that time, that he cultivated his relationship with his spiritual mother and father, Dan & Penny Funkhouser. He also began to pioneer PULSE in the many forms that it took on in its beginning years. Justin has spent a significant amount of time serving as a missionary in several nations as well. He and his wife Katherine now serve as the Senior Leaders of PULSE. Katherine grew up in Murfreesboro, TN. She was raised in a "normal" church going southern family. When she was 11 years old her dad had a radical encounter with God that changed his entire life and greatly affected her. As time went on, she went through the whole "party phase" until she had an encounter with the love of God when she was about to turn eighteen that completely turned her world upside down. With graduation on the horizon, she told God she would "go anywhere and do anything" and His clear answer was, "move to Colorado and go to Charis Bible College." After graduating from Charis she went to IRIS Harvest School of Missions in Mozambique, Africa. She continued ministering with IRIS Global for the next four years in over twenty different nations. Katherine now serves with her husband as the Senior Leaders of PULSE. Been with us from the start. Dustin was brought up in a Christian home encouraged and reminded of prophecies by his parents to follow the Lord. His relationship with Jesus began when he was young and later on in life he felt God ask Him to go to Charis Bible College, Co. It was at school that he really began to know God as a real person, friend and father and not only “a god.” Since then he has served at Pulse enjoying his relationship with Jesus and ministering. Dustin is currently on the leadership team at Pulse and serves as the Youth Pastor. His pastoral heart, genuine interest in connecting with people and the fact that no matter where he is somehow kids and youth flock to him make him great at what he does. “I am passionate because I have the to opportunity to share Christ every week with friends and strangers, develop relationships with godly men and women, and know Him more because of the environment I am in. Pulse is a place that I can connect with others that know Jesus, and grow in teaching and the prophetic.” Some things you don’t know about Dustin is that he has a parakeet named “Chill-bird” and a currently nameless fighting fish. He loves weightlifting, the outdoors, and anything with good food. Joseph grew up in "church" but really came to know Jesus when he was 12 and saw his dad get radically changed. He consumed everything he could, books, tapes, videos, in desperate pursuit of Him. Over the years, he learned how to "go hard" after God, and the results were amazing, but it wasn't until he arrived at Pulse that he understood how easy it was get into His Presence by simply resting in Him. “Some churches are centered around a preacher, just as some households are centered around a TV. Pulse is centered around the Presence. It is where you can come and have a personal encounter with the Living God.” Joseph is the Discipleship Overseer at Pulse and the director of “Transfusion", a team of leaders that meet one-on-one with people and pour into their lives relationally to build them up encourage them in all that God has for them. He is a passionate leader and spiritual dad to many. Something you may not know about Joseph is that he loves a great cup of coffee and movies that make you think. He also has an affinity for card tricks and illusions and loves studying crazy things in science and astronomy. Joseph and his wife Andrea have two adorable children. "Joy is the serious business of heaven..."